The newly designed AOpen MMO-310 mouse is a comfortable mouse with an excellent ergonomics design. The AOpen MMO-310 mouse is suitable for most right-handed users. 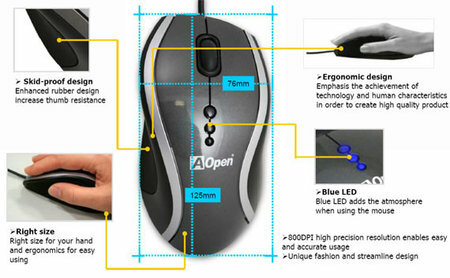 AOpen added a rubber coating to the thumb area of the mouse to improve the user’s mouse control. The AOpen MMO-310 mouse with blue LED lights on its top adds some high technology and luxury feelings to your working environment. With its ergonomic and fashionable design, the AOpen MMO-310 is an all-purpose mouse for your computer. AOpen MMO-310 mouse is available in three different colors. AUO Ultra Slim 42" LCD TV is less than 10mm thick and weighs 44% less!